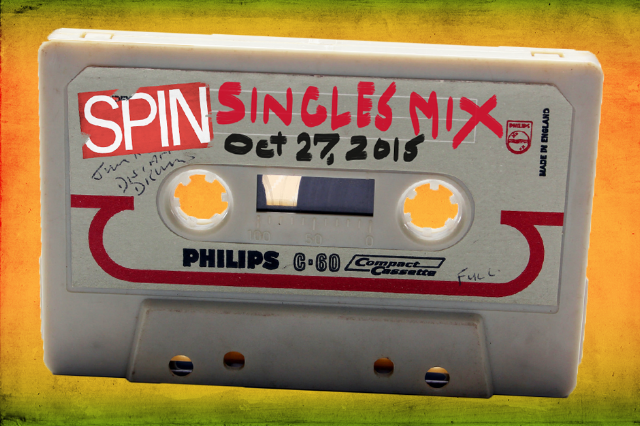 Welcome to SPIN’s Singles Mix! SPIN staffers have rounded up their favorite, must-hear tracks for your personal playlists. Collecting the finest from Southern psych-poppers, art-pop sirens, dance club royalty, and more, these are the songs you need to know right now. Earlier this year, Claire Boucher launched a pseudo-label/artist collective called Eerie Organization to disseminate the new record by the cloistered and morbid Canadian Nicole Dollanganger, a blurry singer-songwriter album occluded by guts, piss, and other questionable bodily fluids. As Boucher preps her latest effort as Grimes, this association highlights a bloody undercurrent to her work that’s sorta been there all along — a fixation on the interactions between fragile bodies and their environments underpinning the celestial melodies. The first dispatch from her new LP Art Angels, follows in that vein using ultraviolence and body horror as a metaphor for a slowly dissolving relationship (“If you don’t need me / Just let me go”), the sort of thing that’ll rip and tear you from the inside — and mangle the remnants. Then you’re just supposed to keep going on like nothing happened, something that the track’s gory video (and melodies that soar as capably as Slowdive on a hang glider) underscore in their contrasts and absurdity. All pain is real pain, the song seems to argue, whether that’s romantic loss or a knife to the ribs. — C.J. Seeing an old flame around with a new love can feel like a kick to the gut, and that’s exactly what Los Angeles grunge-punks Hobart W Fink wish to inflict upon their romantic nemesis in “Boyfriend.” Deciding that “your new boyfriend” looks like the type of guy who’s gonna “beat me up after the show,” the quartet verbally fight back with sneery, chant-shouted comments about said new beaus against some equally imposing power-crunch guitar. It might sound a little juvenile, but don’t go acting morally superior. — R.B. U.K. musician William Arcane’s name is apropos. His last name means “mysterious” or “secretive,” and his minimally melodic blend of trip-hop beats and drops comes with little in the way of biographical information about his intentions or motivations. “Without Me” is no different, a creeping jet stream of surging background creaks and groans, as Arcane’s voice flits about, softly echoing the two-word song title. It’s disorienting in the most tranquilizing way possible. — H.B.